This paper reports results from a contingent valuation based public good experiment conducted in the African nation of Botswana. In a sample of university students, we find evidence that stated willingness to contribute to a public good in a hypothetical setting is higher than actual contribution levels. However, results from regression analysis suggest that this is true only in the second round of the experiment, when participants making actual contributions have learned to significantly lower their contribution levels. As globalization expands markets, and economies such as Botswana’s continue to modernize, there is a growing need to understand how hypothetical bias will influence the valuation of public goods. 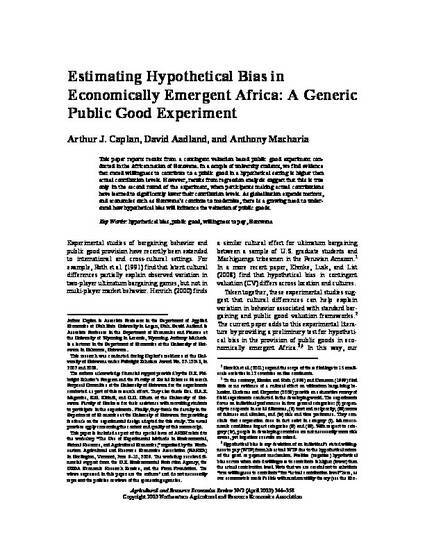 Caplan, Arthur J., David Aadland, and Anthony Macharia (2010) “Estimating Hypothetical Bias in Economically Emergent Africa: A Generic Public Good Experiment.” Agricultural and Resource Economics Review, 39(2), 344-358.